Go to your list of bad ideas and select the second one. Make a comic from that. If this leads to a recursive situation you can make a comic on that. 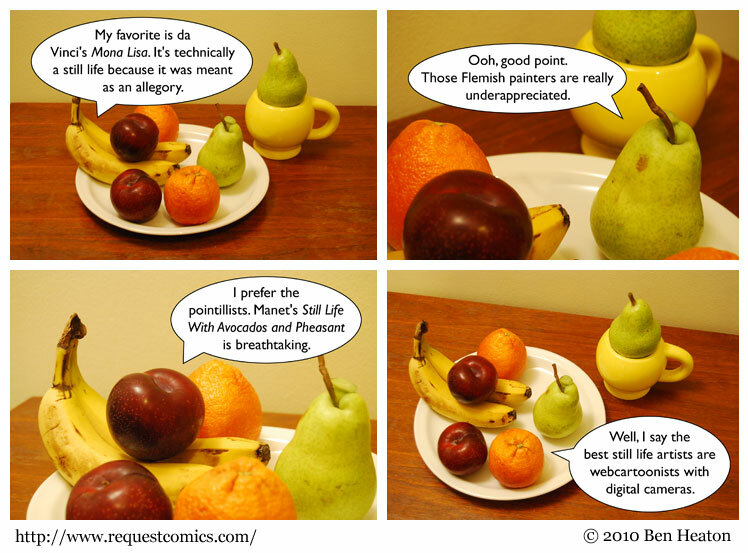 I'd like to see a comic in which various fruits discuss their favourite still life artists, despite it being obvious they have no idea what they are talking about. I think this serves as a good disproof of the idea that requests people flag as being bad actually are bad. Incidentally, I'm not sure if "webcartoonist" is really an accurate term for an online photocomic maker guy. Do online non-photographic comic drawer guys still see it as just their word?